Hard to believe that Spring is just 3 short weeks away. And, even harder to believe that the Market starts 4 weeks from Saturday! That means things need to kick into high gear around here. And, QUICKLY! So, despite the muck and misery that MORE rain brought…we did just that. I haven’t researched it, but, it certainly seems like we have seen more than our fair share of gray, drizzly days this winter. I won’t complain about the lack of snow and ice, but I really struggle when we don’t see the sun and blue sky. And, quite honestly, all the rain is not a blessing at this time of year. I don't think they want to come out of the barn! The winds blew in behind the torrential rains and thunderstorm (!) of early in the week. This is always the way. And, despite the difficulties that wind brings (we lost power for a while one day) at least the mud is drying up. There was awful weather in other parts of the state and several people lost their lives to a tornado...many more losing homes and possessions, so we have nothing to complain about...at all. On one of our trips to town (this was one of those weeks where it seemed like we went somewhere every single day) we picked up a few chicks. The first broilers were set to arrive from the hatchery on Friday, but I had forgotten to increase the number for that batch, so we bought the additional ones in town. Since the nights have been particularly cold, the Boss set them up in the shop for a few days. 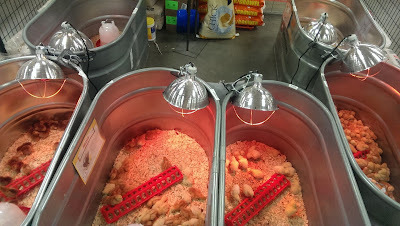 The two groups assimilated quickly and will all head out to the brooder in the morning. We will have fresh chicken for Market before the end of April! We also bought onion sets on our trip to town. Bunches and bunches of onion sets. We’re trying something different this season, so we have three colors of onion sets. Most of these will go into the cooler for storage until planting time. Some of these will actually go in the hoophouse this week (maybe even this afternoon) in hopes of having green onions for the early days of the Market. too bad that chickweed doesn't sell well! But, we have serious germination in the greenhouses! All those seeds I started last week have sprouted and growth has begun. Now, it is just a matter of maintenance until time to transplant the seedlings. Despite the cold, we will be able to plant in the hoophouses in a couple of weeks. By covering the plants at nighttime, we should be able to maintain growth with no supplemental heat. (which is a good thing since we have no supplemental heat) And, we should be harvesting greens again within a month. Then, we worked the sheep. It was time to give everyone a dose of wormer and the lambs got shots to protect them from tetanus and enterotoxemia. This was also our first weight check to see how they are all progressing. And, I must say, I was happy with the results. They all (even the triplets) look good and are growing very well. I guess it's okay that the countdown to Spring really has begun...we're as ready as we will ever be. I found a crocus in the backyard! The weather has been “interesting” to say the least. We started out with a Winter storm that dropped at least 8 inches of snow. That wasn’t too bad, but it quickly turned into sleet, then freezing rain...then just rain. Lots of rain. About 2 inches of rain. This caused the snow to melt and the whole area was under a flood watch. Now, it would take a flood of biblical proportion to cause any sort of issues here on the hill. The lower lying areas of the county had some serious problems with road closings and so forth, but we just watched the creek rise (and rise) until the lower paddock, that we refer to as the “creek paddock”, began to look more like a river. However, by the end of the week, the creek had pretty much returned to its normal size and path. We do still have some snow in the shady spots despite the fact that Saturday’s temperatures reached into the SIXTIES. After the winter storm blew through, the weather turned warmer. Much warmer. It was the kind of weather that lets you know Spring is truly just around the corner and it is time to get cracking on all those early season projects so we can get back in the swing of things. It certainly doesn't look like much this time of year! Because Opening Day of the Market is just 40 days away. I hadn’t really thought about how soon it was until I typed that. It is about this time of year that I always find myself panicked and slightly frustrated that I didn’t get all sorts of things accomplished during the “off season” and I feel unprepared for another Market season. My “to-do” list is always incredibly long and more than a little optimistic. The Boss points out that I indeed feel this way every year so just go on with it...because it always works out fine. So, in the spirit of “going on with it”, I started working on the freezers. I got one completely empty and cleaned out. I inventoried and organized three more and will work on the rest this week. When we harvest the first broilers and lambs, we will need freezer space to store the meat. And, by the time the garden produce is rolling in, all the inventory from last year will be gone and we will be ready to freeze all sorts of things for Winter Sales of ’16-17. Speaking of Winter Sales, it felt more like spring making our deliveries this week. It was great! Last week, it was 23* inside the trailer and the wind was blowing. It was not pleasant at all. But, our faithful and intrepid customers came out anyway! It was far more pleasant this week, although sales were off considerably. But, that’s to be expected this time of year. Our inventory dwindles and we have no fresh produce. It's time to think SPRING and focus on Market preparation. In hopes that we will indeed have fresh produce for the Market, I began seeding. It took me the better part of two days, but both greenhouses are now filled to capacity with flats. There is broccoli, cauliflower, cabbage, peppers, lettuce, spinach, chard, arugula, mache and kale...among other things. While I seeded (and seeded) the Boss worked on some projects that had been delayed by the weather. First, he re-wired all the cords and plugs for the greenhouses. Over time, they wear out and need replacing (wouldn’t want to have a fire hazard). And, since it can still get cold at night, we need the heaters in working order. Then, he worked on re-purposing the “lion cage” into a “ram hauler”. Years ago, he built this little pen-thing to put on the back of the truck to haul Blondie’s show lambs. Since Blondie’s show lambs are now just memories here on the hill, the “lion cage” sat idle out back. (if you’re wondering about the “lion cage”...one of our more colorful friends insisted it looked like it should haul lions for the circus. However, he calls them l-iiiiiiiiiiiiines, it gave us a chuckle and the name stuck). The lion cage is small, secure and can be moved with the tractor. With the new compact ram hauler, we can get Angus back to his summer home without using the trailer and without having a ram rodeo (which I am certain would end badly for someone). Although he seems to be quite content in his special accommodations at the barn where he can knock on the wall and demand his feed when he hears me in the barn, he needs to get out on grass once more. I reckon he will head out toward “greener pastures” sometime in March. Not that anything is very green this time of year...but, with all the lambs growing so well, it was time to allow the sheep to go out into the Winter paddock. After spending a couple of weeks at the barn, they seemed quite happy to go somewhere...anywhere. There’s not much to eat out there, but it does give the lambs a place to run and the ewes seem to enjoy eating their hay “al fresco”. The warmer weather also meant that I could remove all the lamb sweaters. The little guys are getting big! last day of "sweater weather"
As another sign of the impending growing season, the Boss cleaned out the brooder house. I must say, I didn’t envy him that job at all! After housing the layer chicks for months, it was pretty gross and disgusting. But, he hauled all the waste bedding to the compost pile, hosed everything down and it is all clean and tidy and ready for the first batch of broiler chicks that are scheduled to arrive this week. That means we are just 8 weeks from fresh chicken! Time truly does fly. We need to get serious about getting ready for Market season. Another part of Market season preparation is to gather new recipes for our customers. That task falls to me. The Boss is the official “taste tester”. The American Lamb Board has all sorts of pretty recipe pamphlets that we offer, but the internet offers recipes from around the world. This week we tried a lamb riblet recipe from Australia that was DELICIOUS! For some reason, lamb ribs are particularly hard to move. So, I am always on the lookout for good recipes to recommend. So far, this is our favorite. 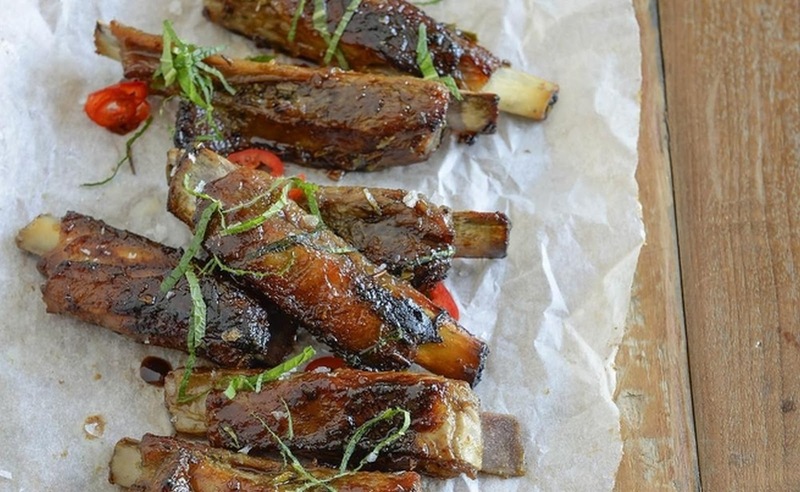 Check out Balsamic Glazed Lamb Riblets. Come back and “visit” again real soon! Wait! Where are the rest of you? I can assure you that whoever decided counting sheep was restful and pleasant, suggesting it as a good way to relax and fall asleep was NOT a shepherd. Doing a headcount, or attempting to do a headcount can be an exercise in total frustration. And, when the counting reveals that one (or more) is missing, it can be indicative of a potential tragedy. Just like the shepherd in the biblical parable (Luke 15), I have been known to head out looking for that one missing animal. However, very much unlike that shepherd, I have done this clad in my pajamas and rubber boots and armed only with a flashlight. More than once. I do repeated headcounts prior to closing the barn doors on winter nights. And, yes, I count them again in the morning. All that to say, I get hung up on the little things. The Boss, not so much. He was ready to paint this year’s lambing as “the best ever” before it ever ended. I just can’t say that. I know. I know. These things happen. But, on an operation our size, every single life counts. Not to say that is not the case on larger farms. But, our margin for error is minuscule at best. I’m pretty sure it was one of those freak things that no one can predict...or for that matter, prevent. You just revise your count and go on. That’s where I often get stuck. But, counting sheep is not unlike counting blessings. Actually, I guess the fact that there are any sheep to count is a blessing in and of itself. But, sometimes you have to stop and go and look for the blessings. Just like those missing sheep. There are lambs. A good number of lambs. Now, don’t laugh. Of course there are lambs. We’re shepherds. There have to be lambs to become sheep. Well, right. But, back in August, when we were in the midst of the “Waylon incident”, lambs for 2016 were not at all a given. We were both resigned to the fact that without some sort of divine intervention, we wouldn’t have any type of lambchop crop…at all. Again, big shout-out to Suffangus Farm. we call this the "lamb beach"
For the most part, the lambs arrived without incident. While I must admit, there is a certain thrill and a rush of adrenaline when we successfully complete a difficult delivery…I would be perfectly content to never do one again. It’s not a good start for the lamb, it’s an invasive procedure for the ewe…and quite honestly, it isn’t fun for me. It’s hard work and it hurts my hand and arm. The glitch in lambing dates meant that we missed lambing in winter storm Jonas. Believe me, that is definitely a blessing! The lambs were born during relatively warm weather. Not like this weekend when the low temperature was 2 degrees. 2 degrees! The lambs are hale and hearty. As testament to good genetics, they hit the ground and started growing like weeds. The hospital pen in the shop is empty. It was never even set up this season! I’m sure I don’t have to explain how this is a blessing. There are no lambs in the livingroom! In the past, the cold, sick ones ended up next to the woodstove. Not this year! The only lamb in the living room is a toy! I am only supplementing a couple of lambs. (they’re still with their moms...we are “co-parenting”) That means we do NOT have seven bottle babies like last year. The memory of that experience still makes me tired. …and we’re not spending hundreds of dollars on milk replacer! Speaking of hundreds of dollars…we didn’t start feeding hay until after Christmas. This means that our hay supply will probably stretch until the grass comes back. Even if it doesn’t, there’s still no way we will have to invest as much money in hay as we have in the past. But, we did manage to get enough hay used up to open the creep pen for the lambs. The creep pen allows the lambs access to hay and warm lights without having to compete with the ewes. All the ewes came through the birth experience with little or no difficulty. Last year we lost two. The little ewe lamb that had the awful case of entropion (the worst I have ever seen) has made a complete recovery. And, the recovery did NOT involve any needles near her eyes! There are 17 ewe lambs to 7 ram lambs. While this is definitely unusual (ordinarily it’s more 50/50) and might mean that we don’t have the rapid growth of ram lambs…it means we have far fewer castrations to perform. That’s a somewhat gross, albeit necessary, shepherding chore that neither of us is particularly fond of. The “stuck” lamb seemed to suffer no real ill-effects from her rather unconventional entrance into the world. The little dog sweaters work perfectly to keep those smaller lambs warm. No floppy edges to get caught on things, or stepped on by the mamas. pretty sure this was not the intended usage! See, I’ve come up with a great number of blessings to count. ...and I didn’t even have to go wandering out in the middle of the night to do it!